A brief segment about preparing and participating in a demolition derby has been added to the Alt Gobo library. It can be viewed by visiting the “About/Samples/Magazine” tab or click on the photo to get to the menu. The clip is 7:44 in duration. The story is about amateur driver John Guazzo, who followed his childhood dream to crash a car in a demolition derby. The program follows his final preparation and running the race. The derby is a competition where drivers collide their vehicles into opponent’s vehicles and win if they are the last ones still moving. 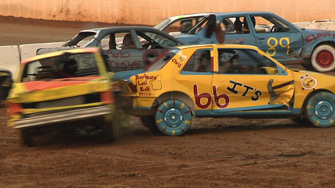 There are four classes of vehicles and the derby is run four times a year at Potomac Speedway in Budd’s Creek, Md. Proceeds go to area charities. The event was recorded in June 2009 using a Panasonic HPX170 tapeless video camera capturing to P2 cards. Camera was set to record in high definition at 720P. Peter Roof produced, photographed, and edited the program.